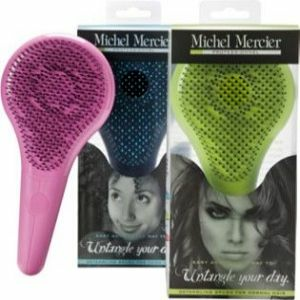 The revolutionary Ultimate Detangling Brush was designed by international hair designer Michel Mercier to gently detangle hair in just seconds. It glides through hair with almost no resistance to offer smooth, pain-free detangling. You will reduce breakage and hair loss caused by traditional brushes. There are three styles offered for the detangling brush to fit your individual hair type. The unique design of the brush allows for complete detangling with reduced pressure and fewer strokes. Most brushes have only a few contact points; the Ultimate Detangling Brush has 428 perfectly placed bristles that flow easily through tangled hair. This allows you to quickly detangle hair without pulling and tugging on the hair; this will eliminate unwanted damage and hair loss. There are three styles available, so fine, normal, and thick coarse hair can be effortlessly detangled in much less time than with ordinary brushes.